Shortly after I gave the go-ahead on the photoshop colored-version, I received my first look at the painting in-progress. 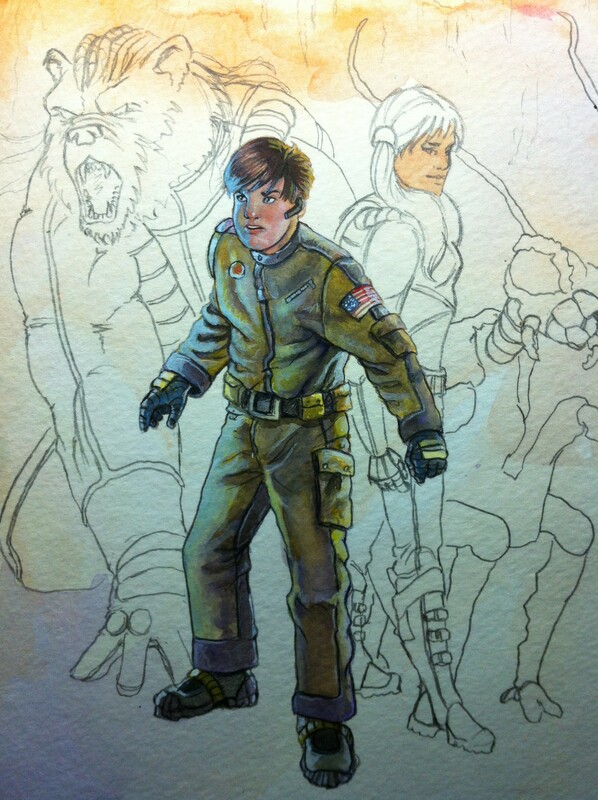 Scott Christian Sava modeled Zack on one of his sons, aging him up a bit (by about four years). All the kids basically wear cultural variations of the same uniform, just like the Boy/Girl Scouts do now. The uniforms are designed to look futuristic, but not in that campy, cheesy 70s sci-fi way. I wanted them to look practical and useful. If you compare this to the first picture of Jenny, you can see that her hairstyle changed. She was always supposed to have long hair. I made a point in the story of describing how it was her way of rebelling against her mother who insisted fashionable, short hair was more practical for women who lived in space habitats and worked regularly in microgravity environments. Jenny spends most of the year at the Cytherian Academy on Venus (an aerostat, or floating habitat high in the clouds of Venus in a thin band with favorable pressures and temperatures for human habitation), so that’s not a concern for her. She is very fashion conscious, though, and doesn’t always choose the practical route when it comes to clothing, as you’ll see in the future pictures when she gets some color. 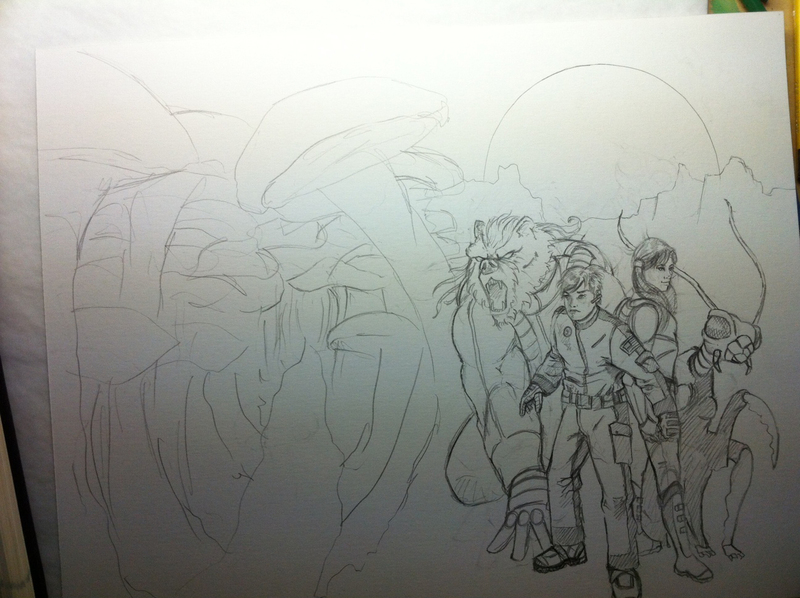 With the final design agreed upon, Scott Christian Sava provided me with some quick colo r ideas. He scanned the sketches into Photoshop and used that software to color the image quickly, to give me an idea where he was thinking of going once he started putting brush to canvas. Since he’s using a physical medium (as opposed to purely digital like a lot of artists these days), it’s important to work out color details ahead of time; changing Mungus’s fur, for example, is no trivial matter when we’re talking paint on canvas. As I alluded to, my feedback was to darken Mungus’s fur and Ix needed a complete color change. The valtraxian is brown with stripes. Jenny’s hair is dark in my 1st draft, but I actually don’t mind the light-haired look here. It’s easy enough to change in the manuscript since I only mention her hair color once or twice. Looking at book cover art separately from the book is an interesting experience. Most people aren’t used to seeing art that’s so right-justified. When you’re designing art for a cover like this, if you’re going to have wraparound art, you need remain aware of what the title text, blurbs, UPC codes, etc. will obscure. I like how the forest in the background frames the area reserved for the cover copy (the blurb). The title should look really nice with that big orange sun behind it. After tweaking the design of the four main characters, cover artist Scott Christian Sava sent me a sketch that included background elements. You can see the sun rising (or setting) over snow-capped mountains behind the protagonists. They’ve crashed on a planet called Bestic, part of the 39 Cygni system, about 260 light years from Earth. 39 Cygni is larger and brighter than ou r sun, but cooler. It’s classified as an Orange Giant. No swampy tropics on this planet, at least, not where they crashed. They crashed in the mountains, so they have to hike to the city where they were supposed to land. To the right, you can see a path heading down what looks like giant mushrooms. They’re not really fungus, but I envisioned this world as having trees that resembled mushrooms in texture and look. They’re also edible, if you know how to cook them. I just thought it made it seem more otherworldly than just having trees with oddly colored leaves. The initial concept included the city in the background, behind the kids. Right now, that’s been pushed aside. At the size he would have to draw the city, there wouldn’t be much detail to see anyway. As you can see from the previous picture, Ix is resized and still visible behind Jenny. I know big bugs are anatomically impossible due to size limitations of chitin and things like that, but when people mention that, they’re talking about giant insects from Earth, like movie monsters from the ’50s. Valxtraxians, like Ix do have exoskeletons and molt, but they also have a more rigid internal structure, similar to bones. The exoskeleton is a defense evolution to protect them against Valtra’s predators. I’m trying to keep much of the science of the Zack Jackson series rooted in the real world and out of the realms of fantasy, yet still make it accessible for young readers. I also hope to make it appeal to boys and girls, because we need both genders in the sciences helping advance our civilization and understanding of the universe around us. 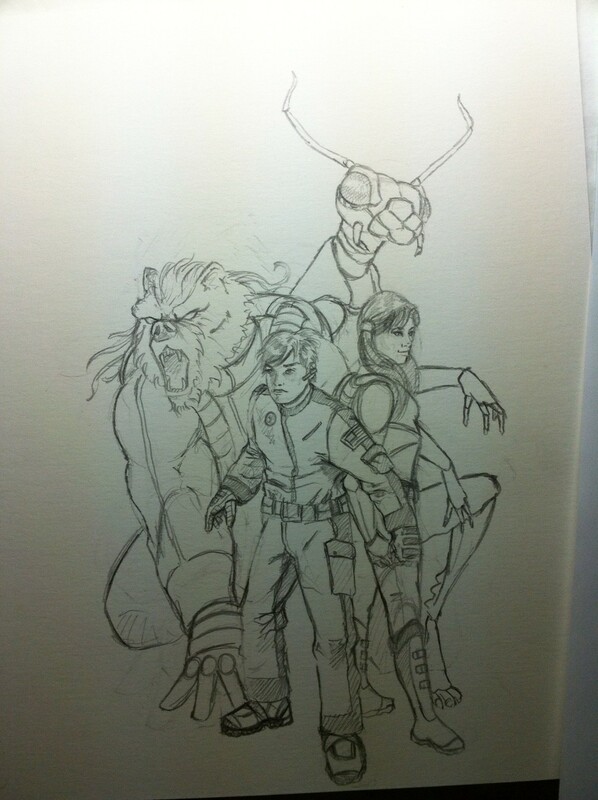 After going back and forth a few times discussing options, the artist, Scott Christian Sava, sent me another sketch. This one included all four main characters. The art style is inspired by the pulp sci-fi magazine covers of the 50s and 60s and by artists such as Frank Frazetta, Michael Whelen, and Syd Mead. I approached Scott to work on my cover after he posted pictures of a series of watercolor paintings he was working on as practice in a new medium. I was just joking around and to my surprise, he showed interest and we started a dialog about the cover. At that point, I wasn’t even finished with the first draft of the manuscript! In this picture, you can see Zack and Jenny from the previous picture. Jenny’s look has been updated. To Zack’s left is Mungus, an Ersidian Junior Ranger about a year older than Zack. Mungus underwent some developmental changes as well; I didn’t save all the interim steps. This picture was also my first look at the Valtraxian, Ix (behind Jenny). I describe Valtraxians as being a sort of cross between grasshoppers and praying mantises. These four characters are the main characters of Zack Jackson & the Cult of Athos and will be featured heavily in subsequent novels. Ix is too big in this picture. We spoke briefly about what do to about that; my wife suggested he and Mungus switch places. I suggested maybe Ix could go on a rock behind the other three. The final solution was probably less work for Scott, but the results were excellent. I’ve been working with Scott Christian Sava of The Dreamland Chronicles on the cover art for the debut novel in my Young-Adult Science-Fiction series, Zack Jackson & the Cult of Athos. 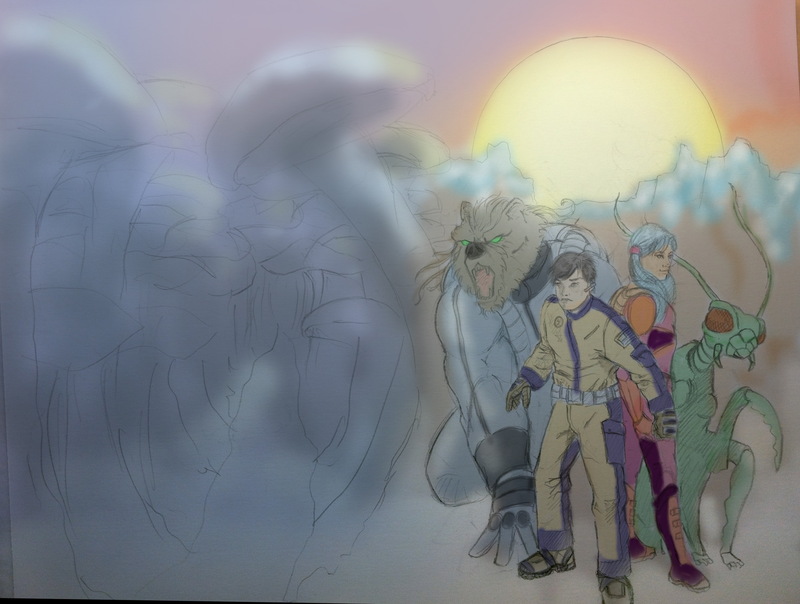 This will be the first in a series of posts showing the cover from initial conception to finalized version. 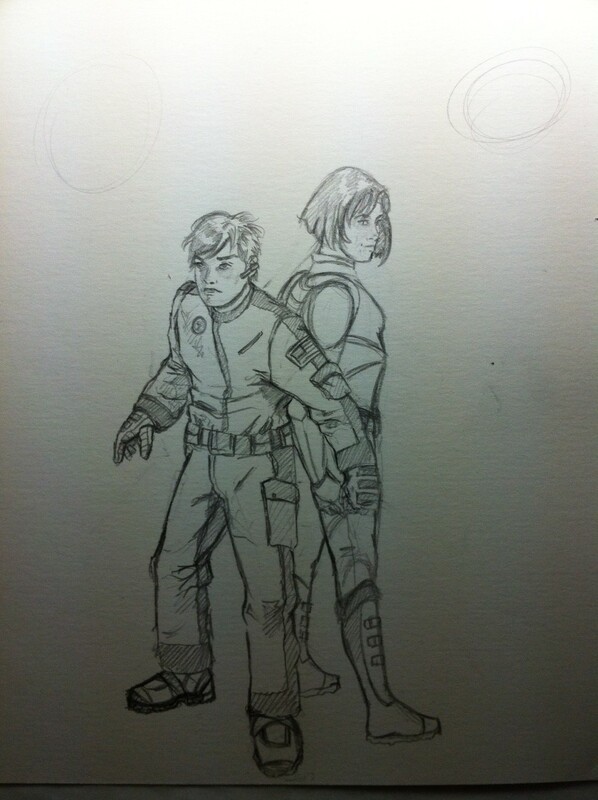 The first sketch is of two of the main character, Zack Jackson and Jenny DuBois. They’re both humans. Zack is about 12, Jenny 14. In this first sketch, I really liked Zack’s look; I don’t think I changed any of it. Jenny, however, I describe as having long hair, with two braids. I also described it as “dark” in the first draft, but Scott suggested something unusual, perhaps blue. I hadn’t really thought about going that far with her look, but I kind of like the idea. Zack and Jenny are both Junior Rangers, the 43rd Century-equivalent of Boy & Girl Scouts. Zack is from a typical Earth family in Wamsutter, Wyoming. His father is a civil engineer who works in San Angeles (a megaopolis comprising most of the southern Californian coast from north of San Francisco to south of Los Angeles; commuting that distance is no problem in 4212) and his mother is a teacher. Jenny is from Messier Habitat, a Bernal Sphere at one of the Mars-Sun Lagrange Points (very nationalistically French).